Wellness for the World: Is it a Cold or Flu? Do you feel lousy due to recent illness? This is not a surprise with as challenging of a winter most have faced in the US this year. Record cold, record snows and simply too much time stuck in confined areas because you simply cannot be outside as much as you'd like. 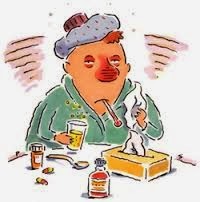 So is it really a surprise that so many of you are finding yourself battling a cold or flu? So does it matter if you have the cold or the flu? Well yes, absolutely it does. If you have the influenza virus and this is taken care of properly, you could end up with more serious issues such as the development of pneumonia. Now this will not happen to most but this still shows the importance of taking care of yourself during this time. While both are caused by viruses that produce some of the same symptoms, there are definite symptoms you can look at as shown below. So with this chart you can see the benefit of asking yourself some questions. Do I have nasal congestion, a stuffy nose and frequent sneezing? Do I have a runny nose with a thick discharge? Do I have a moist cough? If your symptoms tend to be from the neck up and come on gradually, it is most likely a cold which is caused by approximately 200 different viruses. Do I have a high grade fever at 102 degrees or more? Do I have chills, extreme fatigue, muscle aches and pains? Do I have difficulty breathing or shortness of breath? If your symptoms come on suddenly and your body feels week and tired, it is most likely the flu. Understanding these stats below will show the importance of addressing this with some urgency. On average annually in the US: 5% to 20% of the population gets the flu, over 200,000 people are hospitalized from flu complications, and about 23,600 people die from flu-related causes. What to do with a cold? Removal of carbs and sugars from the diet until completely well. At the first symptom, pull out simple carbs and sugars, which can feed infection. If hungry, eat tons of soup, healthy forms of protein, vegetables, and vegetable smoothies. Don't believe the old saying "starve a cold , feed a fever"
How about general support so you do not develop a cold or flu? Let’s first look at the lifestyle aspect to improve your immune system function. Stress plays a significant role in challenging immune system dysfunction. I have seen stress over the years significantly lower white blood cell count and put countless individuals in a challenged state. One easy practice you can incorporate to improve your stress levels is to practice deep belly breathing. Take a deep breath through your nose while breathing down to the area of your belly button for a count of eight seconds. Hold that breath for four seconds and then forcefully release this breath while contracting your stomach muscles. This will allow for optimal oxygen supply to the cells in your body and understand that you cannot be stressed and take a deep breath at the same time. I would recommend 3-5 of these breaths each hour of your waking day. Proper sleep cycles play such an important role in immune system function. Believe it or not this starts with good digestion and proper nutrition which includes the consumption of foods that contain the essential amino acid L-Tryptophan. This is then converted to Serotonin and eventually Melatonin, which is of utmost importance to initiate the high immune system response while you sleep. Another way to impact your immune system is to support your lymphatic system. In my opinion, the best way to do this is by using a rebounder. You know…one of those little trampolines. Jump on this for at least 5 minutes per day and if you feel any health challenges coming on, rebound a couple of times per day. This is healthy and fun. You can also dry skin brush to assist your lymphatic system. Get one of those long handled body brushes and every day before you shower, brush your skin from the extremities of your body toward your heart. This not only assists the lymph but also your skin and kidneys. Staying hydrated is also very important and often for those in cooler climates water consumption is reduced quite a bit at this time. Be sure to be drinking approximately one quart for every 50 pounds of body weight daily. Let’s look at a way to assist your immune system and address it at the core. About 80% of your immune system function originates in your gut, so be sure to create a healthy environment in your GI tract. One powerful way to address this is to take a quality probiotic daily. Personally, I take a prebiotic/probiotic formula with amazing results. I have seen much success with this product in my family as well as with my clients. One of the most supportive supplements for your immune system is a quality vitamin D supplement. I will also share that this supplement is best taken as a liquid. While the recommendations for addressing the cold and flu naturally are definitely a benefit, the ultimate focus would be to keep your immune function high and fight this off before you become symptomatic. Enjoy the rest of your winter and please stay warm and safe.